Prestigious and fully renovated centre with modern street presence. Full time or flexible 'Hot Office' arrangements available. Diary management and detailed call handling services available. 24/7 access. Each office individually alarmed with back to base security monitoring. State of the art electronics and technology. Professional experts and friendly staff on hand. Attractive reception, courtyard and coffee area. Highly recommended by existing clientele. All prices include GST. Centrally located 5km from Newcastle CBD amongst businesses, shops, cafés, pubs, libraries and banks. Easy access to public transport. Ample free parking. 2 hours north of Sydney. 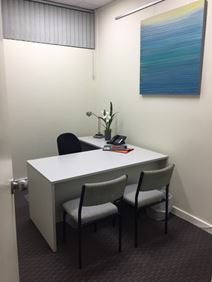 These professionally fitted business offices are conveniently located in the inner city of Newcastle, just over a five-minute walk from Broadmeadow Railway Station. The offices can accommodate from one to four people on flexible terms, with no minimum contract length. Diary management, detailed call handling services, dry cleaning and all your secretarial needs are on hand thanks to the on-site administrative staff. You pay for what you use here in this centre, so there are no hidden charges, and special offers are available for long-term tenancy. These purpose-built boutique serviced offices are situated in the heart of Newcastle"s CBD. Each office is individually alarmed and soundproofed for privacy. The area is full of cafes and restaurants, and museums and galleries. 14 offices are available in this impressive business centre, accommodating one or two desks per office; the space comes fully equipped with high quality furnishings and fittings throughout. A superb range of facilities and business support services are available to help your business grow. The building also boasts excellent public transport links - the train station is a very short walk down the street. Designed to help you and your company grow in a friendly and supportive atmosphere, this business centre is located just five minutes from Newcastle's CBD and has extensive free parking. A relaxed environment that encourages mutual co-operation and communication. The current occupants are a mixture of experienced professional groups and young business that collaborate while maintaining their individuality. Office space prices ranging from $390 - $1281 per month. A well-furnished co-working space. There are bike racks, lockers and shower facilities. Meeting rooms are available to book. There is 24 hour building access. Frequent networking events are held. Situated in the core Charlestown area, on Ridley Street. The centre is opposite the Charlestown Square shopping centre. Close-by, there are many restaurants, shops and cafes. Newcastle is a 16 minute drive from the space.